- You can now play your music while you play Little Master Cricket. Just start it playing before launching the game. 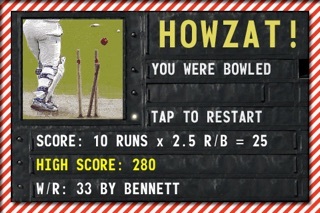 - You can now play the game with the opposite orientation (with the batsman on the left of the screen). Just flip the device around. 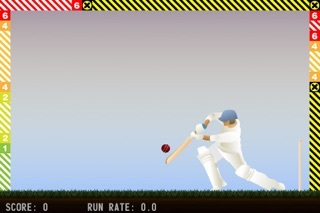 Little Master Cricket is an addictive and intuitive batting challenge, using a ragdoll physics engine and a unique control scheme to put you in direct control of the bat. Swing the bat to hit the ball towards the striped scoring zones, but avoid sending it to the yellow-and-black zones, where you will be caught! Defend your stumps! Choose your strategy carefully: will you play defensively and avoid going out, or will you try to slog your way to a quick century? Try to get a high score, but don't play too conservatively - your score gets multiplied by your run rate when the game ends! You'll need good concentration and skill to be declared world champion, and to earn the title of the Little Master. *Realistic physics engine with fluid gameplay. *Multiple types of delivery: top spinners, back spinners, fast balls, and the occasional full toss.